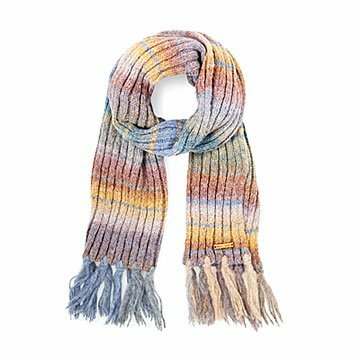 Knit with dip-dyed yarn, this scarf will keep you toasty and colorful. When you're warm and toasty, anything seems possible: ice cream in cold weather, enjoying flurries just a little longer, spontaneous snowmobile rides. Knit with dip-dyed yarn, this scarf will keep you cozy and colorful, and a touch of fuzzy fringe makes staying warm a stylish endeavor—because winter looks good on you. Made in China. Make it a set! Click here to see the matching Dip-Dyed Rainbow Fingerless Gloves and Dip-Dyed Rainbow Beanie.